GoldStock Jewelers has closed for good on January 12, 2019. We highly recommend you to check out Henne Jewelers for your jewelry needs. 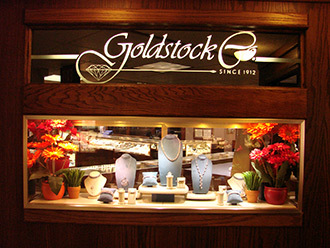 Goldstock Jewelers is located in the historic Clark Building on Liberty Avenue in downtown Pittsburgh. We are one of the most trusted and reputable jewelers in the Pittsburgh region. Our two locations, Goldstock and Goldstock 715, provide our customers with an easier shopping experience. Our street-level showroom, Goldstock 715, provides our customers with many quality timepieces, pearls, sterling silver jewelry, diamond jewelry, engagement rings, diamonds, and Pandora charms and jewelry. Our second-floor showroom is much larger and displays a much wider selection of our merchandise. In this showroom, we offer loose diamonds, engagement rings, diamond jewelry, gemstones, pearls, and sterling silver. Both of our showrooms provide a warm and elegant setting for selecting diamonds, engagement rings and wedding bands, colored gemstones, 14 karat gold jewelry, pearls, and watches. © 2019 Henne Jewelers. Henne Jewelers | All Rights Reserved.